ServiceTrade users who submit quotes to their customers for approval may find that they need to respect and enforce those customers' purchasing and procurement departments. In particular, you may have certain customers who require that a purchase order be supplied with every repair quote that is approved. 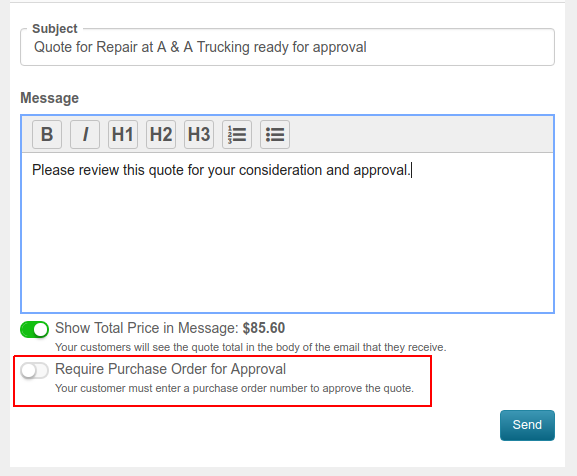 To support this requirement, it is now possible to indicate that a purchase order is required when submitting a quote to a customer for approval. If you choose to require a purchase order, then the customer must supply a purchase order number before being allowed to approve your quote. Otherwise, the customer may provide a purchase order number, but it is not required.